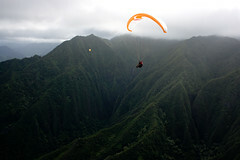 Eleven pilots flew in perfect tradewind conditions at Kahana today. Eight of us sauntered downrange to gaze at the pornographic splendor of the scenery around Sacred Falls. Along with Don, Czech Pete, Jon, Berndt and me, visitors Jaro, Pete Reagan and Bernie were treated to views of unabashed natural beauty. One-Eye, HillBilly and Chicago Tim held down the fort back at the Kahana ridge, joined by Berndt for his second flight. Welcome back, Bill! Nice blog Alex, nice pix; however you left out the most important one:- THE CENTERFOLD!!! Did any of you get a shot? Nice flying with ya'll yesterday ! !